What Are the Dangers of a MRSA Infection? Methicillin-resistant staphylococcus aureus, more commonly known as MRSA, is a type of bacteria that can cause a serious infection. Staph bacteria are a common source of infections, but according to the Centers for Disease Control and Prevention, the main concern about MRSA is that its among a group of Multidrug-Resistant Organisms, which means the most common types of antibiotics prove ineffective in treating the infection. People should see their doctor if they have an infection and aren't sure of its origin, especially if they have been hospitalized recently. MRSA can have some dangerous consequences, including serious skin or joint infections, pneumonia or inflammation of the heart, organ disruption and even death. An abscess, rash or draining cut or wound in the skin may be the first sign of a staph infection. Testing will determine if the infection is MRSA. A common skin infection that people with MRSA get is cellulitis, a painful inflammatory skin disease, notable for a red rash that can become swollen, tender and warm, according to MayoClinic.com. Without treatment, MRSA infections can spread, sometimes causing an inflammatory bone disease called osteomyelitis, which the National Library of Medicine's Medline Plus Medical Dictionary describes as usually painful and that "may result in death of bone tissue." If MRSA enters a joint, it can cause arthritis. 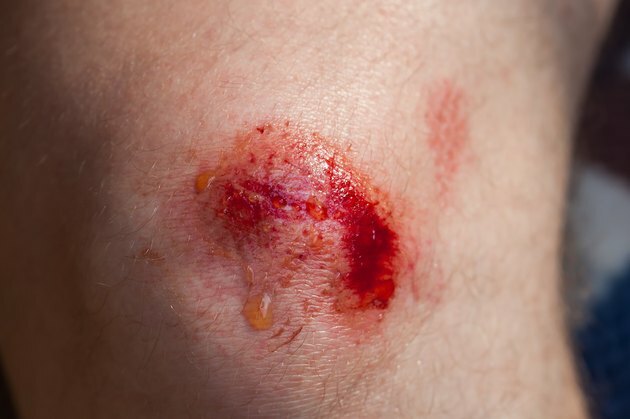 People with diabetes, who already have difficulty with wound healing, prove especially vulnerable to MRSA infections, particularly if they are on dialysis. Such an infection could potentially lead to an amputation, according to a July 2007 article in Podiatry Today. MRSA infections can get into the bloodstream. Once there, the bacteria could potentially affect many different organs, including the lungs and heart. If it reaches the lungs, it can result in pneumonia. It can also cause a type of inflammatory heart condition called endocarditis, which the Medline Plus Medical Dictionary says calls an "inflammation of the lining of the heart and its valves." The Johns Hopkins hospital infectious diseases web page about MRSA notes that bacterial infections that invade the bloodstream may cause septic shock. The sudden onset of a fever and persistent low blood pressure can indicate septic shock, or toxic shock--a type of septic shock that could result from a MRSA, according to the online Merck Manual for Healthcare Professionals. Both septic shock and toxic shock are critical conditions. Without immediate treatment, organ disruption, including kidney failure, can occur, and it could even cause death. What Are the Dangers of Leaving Tonsillitis Untreated?